Sallisaw, county seat of Sequoyah County, is located at the edge of the famed Cookson Hills to the north and the navigation channel of the Arkansas River to the south. Its name is from the French "salaisiau" meaning "salt provision." Indians, early settlers, explorers and trappers were familiar with the natural salt deposits found by many nearby streams. "The Grapes of Wrath" author, John Steinbeck, used Sallisaw as the starting point for "Okies" fleeing to California to escape the "dust bowl" drought days. Actually the eastern part of Oklahoma has always been wooded and picturesque; it was western Oklahoma where the dry, flat land and blowing winds created the "dust bowl." 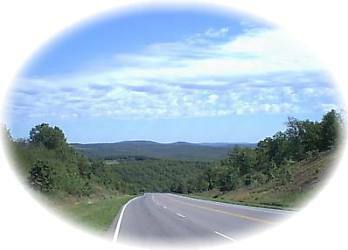 Charles "Pretty Boy" Floyd and other notorious outlaws who used the tugged and inaccessible Cookson Hills to hide in in the 1930s would surely marvel at the four-lane interstate highway, the diesel trains and the barge traffic on the Arkansas River that now connect Sallisaw with the world. Present-day Sallisaw is an expanding center for commerce and tourism. Lakes for fishing and water sports, drives to historic landmarks, horse racing at Oklahoma's first pari-mutual track, state parks for camping and hiking, golf, tennis (or just relaxing) all begin and end at Sallisaw! We cordially invite you to come see Sallisaw. Historical information throughout Sequoyah County. Sequoyah was born in the lower Appalachian region of Tennessee about 1770. His mother was a member of the "Paint Clan" of the Cherokee Nation and his non-Indian father, Nathaniel Gist, left the family when Sequoyah was very young. Sequoyah grew to manhood among his kinsmen, the Cherokees. This nearly block-long mural illustrates historical events throughout Sequoyah County in a collage of 21 paintings.